A cash machine has been torn from the wall of a filling station in Irvinestown, County Fermanagh. The built-in ATM machine was removed by a digger, which police suspect was stolen from a nearby building development. 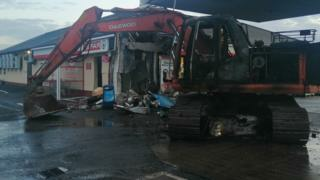 The thieves are understood to have loaded the cash machine onto a trailer before setting the digger alight and fleeing. The incident happened at Dromore Road around 04:05 GMT on Sunday. Oil which was spilled on the forecourt during the incident has been removed and the shop has reopened. Detectives have appealed for information about the theft, which they said had left "extensive damage" to the filling station wall. They have asked anyone who noticed any vehicles being driven in a suspicious manner in the area between 03:30 GMT and 04:10 GMT to come forward. Earlier this month, the PSNI announced the creation of a new team of detectives to investigate cash machine thefts, following an upsurge in the number of built-in ATMs being ripped from the walls of commercial properties by plant machinery. Speaking about the latest incident, PSNI Sergeant Brian Reid said: "We are investigating whether this ATM theft is linked to any other recent thefts." Retail NI Chief Executive Glyn Roberts described the latest robbery as a "disgusting attack". "The growing number of these attacks is a major cause for concern, given that these criminal gangs are able to hit retailers and bank branches in every part of Northern Ireland," he added. "Unless these criminal gangs are caught, many rural areas of Northern Ireland could be ATM free zones which will have a negative impact upon consumers and rural communities."